What if Animals followed religion? If animals had religions, they would have wars. There would be complex political relationships between and among the different species of the earth. LMAO. I love that meme. Hey think about if food had a religion. They would worship the flying spaghetti monster. Its called " sausage party", food worships humans. We'd be fucked even more than we are now. What do you think your life would be in another universe? What would you name your baby? If you could travel in time to witness one historical event, which would it be? Do you hate liars and dishonest people? Has your dog ever set your car on fire? Totally plausible. If religion is a byproduct of our tendency to associate natural phenomena with an agent, as well as a coping mechanism for the inevitability of death, it would seem plausible that perhaps some animal has or will in the distant future start practicing religion. Hmm good question, they'd need some form of sentience don't they? Most religions, including Pagan ones tend to use some animals as some form of symbol or something. 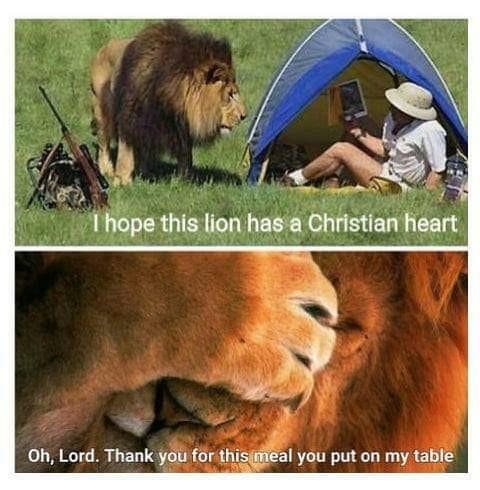 LOL ok that was one a good as a Christian I found this very funny. I know this much life would certainly be interesting if animals followed religion. What if they have some kind and we just are oblivious? They'd put us to shame (not like many of them don't already). Home > Other > What if Animals followed religion?